Home » Posts tagged "List of 14 Importance of Learning Finance"
You know finance is not only receiving money from different sources but also proper utilization of money or financial resources. Here utilization means investing money in accordance with risk-taking behavior where the return is maximum. The main objective of financing is to ensure the right amount of money at the right time. For better economic and financial decision making you have to have basic knowledge of finance and financing. Every day we take financial decision although we are not aware of, we are actually doing financing like a corporate finance manager. If you want to take a better financial decision then you must know the core financing principles. Here in this article, I will clarify the 14 importance of learning finance both for the individuals, corporate finance manager, and organization. The reason I want to discuss the importance of learning finance is to motivate you to learn finance and apply it in your daily life which will help you to become a better decision maker. How to Learn Finance and where to learn Finance? You can do graduation or post-graduation in finance and also get a CFA degree if you have passion enough. 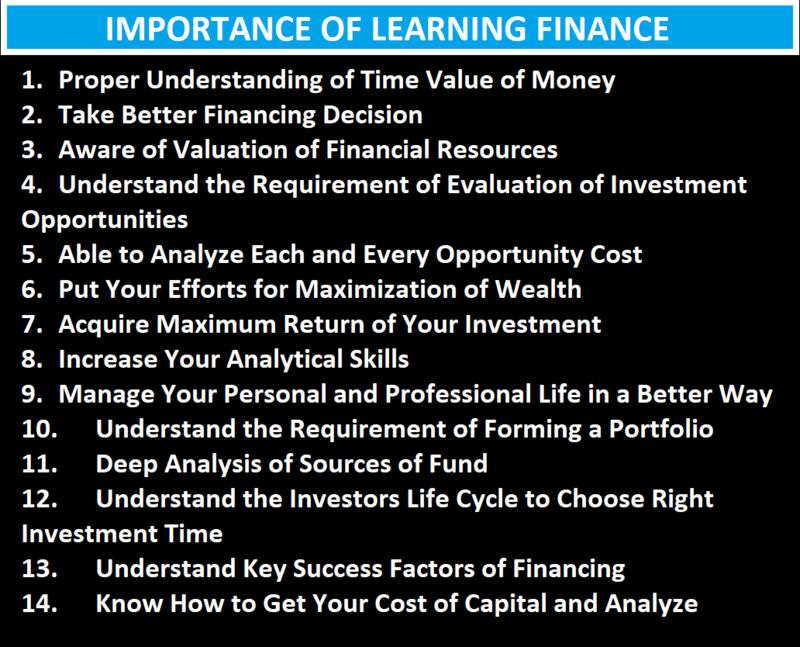 The importance of learning finance is given below which are listed from a different perspective. Hopefully, this will add value to your learning phase. The most important thing is to take a better financing decision as every financing decision both for borrowing and lending is related to cost and benefit. A better financing decision will bring financial success which is expected by every individual. If you actually want to know finance then you must know the concept of the time value of money that with the time passes the value of your money is decreased. So, to ensure value maximization you are to invest in a way which increases the net present value of your wealth. As an investor of both money and capital market, please make sure that you do proper valuation otherwise you may lose your valuable financial resources. That’s why every investor needs to be aware of valuation of financial resources or instruments. The proper understanding of the requirement of evaluation of investment opportunities will induce you to do capital budgeting (NPV, IRR, PBP, MIRR, PI, etc.). Both for long-term and short-term investment opportunities need to be evaluated, especially for long-term investment opportunities. Every decision whatever we are taking in our daily life we forgo other opportunities, so it is required to do an evaluation of opportunity cost and invest where your opportunity cost is lower. The investment decision is actually dependent on the behavior of investors. You need to learn finance because investors always intention are to ensure maximize their return on their investment. Here, the maximum return will increase the value of your asset. A financially sound person always tries to put all of his/her efforts for maximization of wealth. Maximization of wealth will bring more profit for you or for your organization. Whenever you plan for the collection of funds you may find several short terms or long-term sources. If you have adequate knowledge of financing then you will be able to do a deep analysis of sources of funds. But one thing is you must know financing concepts and how it works. Whatever the amount of capital, is not free of cost. Every capital has cost, so before taking an investment decision you have to calculate and analyze the cost of capital but before that, you must know the finance. That’s why there is huge importance in learning financing. After knowing finance properly, you must know what is a portfolio and why we form a portfolio. A portfolio is a set of a different mixture of investment where both risk-free and risky investment is there, the main purpose is to decrease the overall risk of investment. If you learn finance then you must know how to form portfolio both for individuals and organizations. If you want to become financially sound person then you must know finance and after that, you will be able to manage your personal and professional life in a better way. Your financial strength will be increased by the right financing decision. Be aware of an investor life cycle and choose when to invest and when to save your valuable money. Your money is your asset, it is your decision whether you want to grow it by investing it at the right time. Behind every successful finance manager, a secret is there, the secret is understanding the key success factors and application of the factors at the right time in the right place. Ultimately by knowing finance deeply, you will be able to increase your analytical skills. You will be able to take good financing decision which will give you financial freedom, maximize your wealth and increase your spending power. If you have any confusion about anything related to the importance of learning finance then please let me know, I will try to clarify it further.